It is with regret that the current site for the Ormeau Clinic is now closed. The decision has been a difficult one as Dr Robert and Nurse Karen have been part of this Practice and community for nearly twenty years. As a team that truly cares for the well being and comfort of our patients, we must now look for more suitable premises where our patients can feel safe and comforted during the time away from their homes. 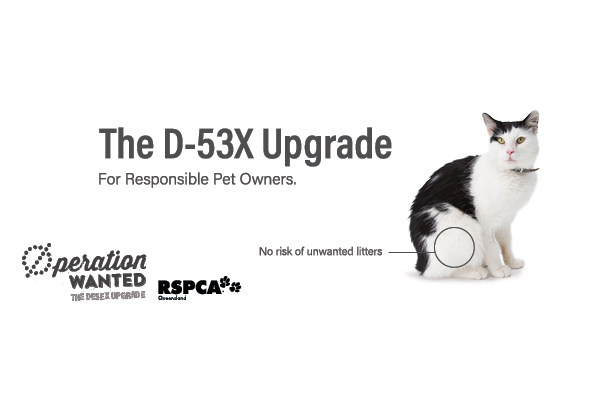 We assure all that this is in the best interest of our clients and their pets. We will still be providing a service to our clients, via our house call service and Arundel Surgery, while we attempt to find new premises and, we express our gratitude to all our loyal clients over the past twenty years. We invite you to continue to phone 5546 6205 to discuss all your pet's requirements. Dr Robert and all the vets and nurses at Companion Care vets. 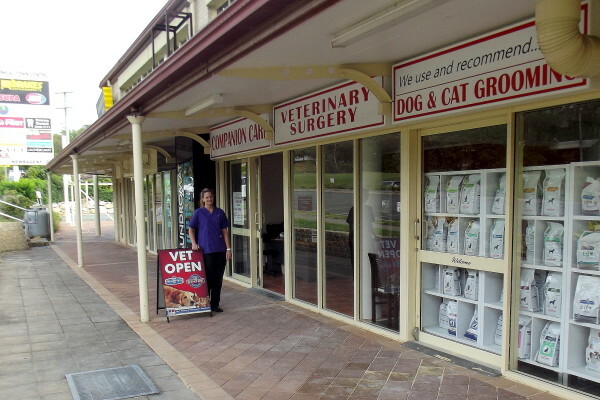 "Raising the standards of care for pets and their owners in Ormeau and the surrounding areas"
Managing our team here at Companion Care Ormeau is Dr Robert who has worked and lived on the Gold Coast for the past thirteen years. 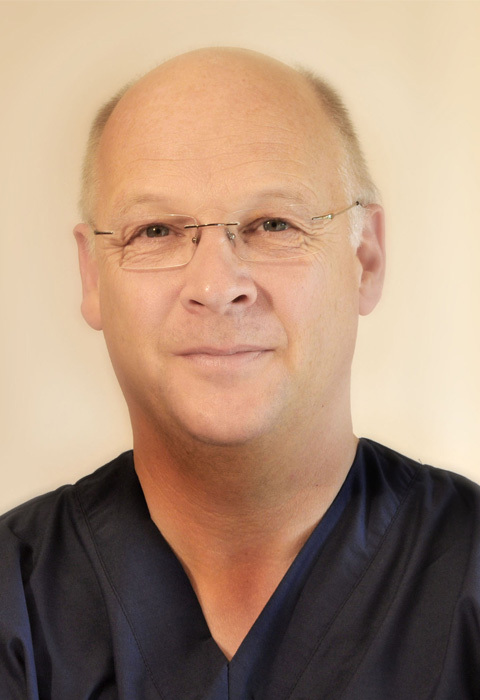 Robert has over twenty years experience in General Practice & Emergency Centres. If your pet is involved in an emergency during our open hours (shown at bottom of page) please contact us immediately for first aid and advice. 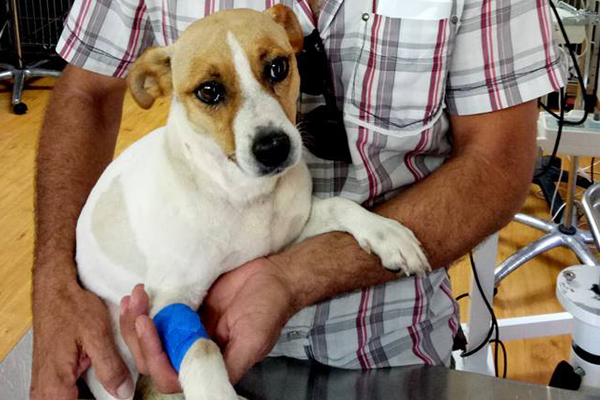 If an emergency occurs after hours, please phone the surgery on 5546 6205 and you will be directed to the vet on call. 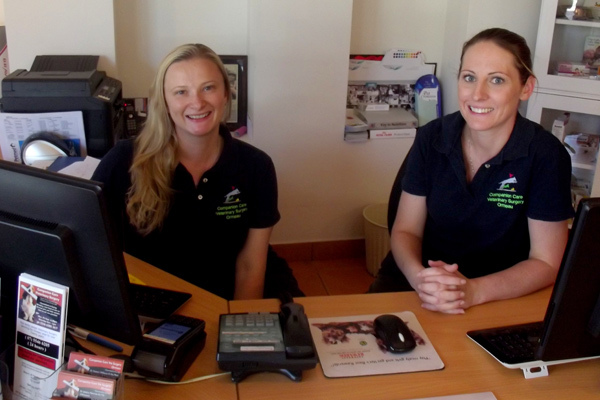 At Companion Care Veterinary Surgery Ormeau we pride ourselves on our friendly and personal service. Our purpose is to share our love and passion for animals through veterinary excellence. Our surgery has recently been renovated and updated to include facilities for treating the most serious of tick paralysis and snake bite cases. Our qualified staff endeavour to care for your pets as their own, providing a professional and modern healthcare facility. 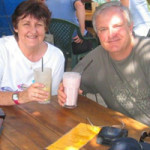 Robert has over twenty years experience in General Practice & Emergeny Centres. 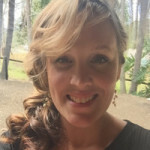 Dr. Charlene joined us in May 2017 and has a passion for medicine and surgery. Dental and Oral hygienic care is very important to the overall health of your beloved pets. Pets will often instinctively hide their pain from mouth related illnesses, perceiving it as a weakness and they may even become irritable. At different ages, your pet will need different nutrients. For the optimal health of your pet, it is necessary that these needs are consistently met. This is why our staff are happy to assist you with making the best decisions regarding your pet’s diet with our nutritional advice services! Ultrasound is an important method of Diagnostic Imaging that helps us look inside your pet. This help will our veterinarians accurately identify a problem and create a more specific treatment plan. If your pet is involved in an emergency situation during open hours please contact us immediately for first aid and advice. 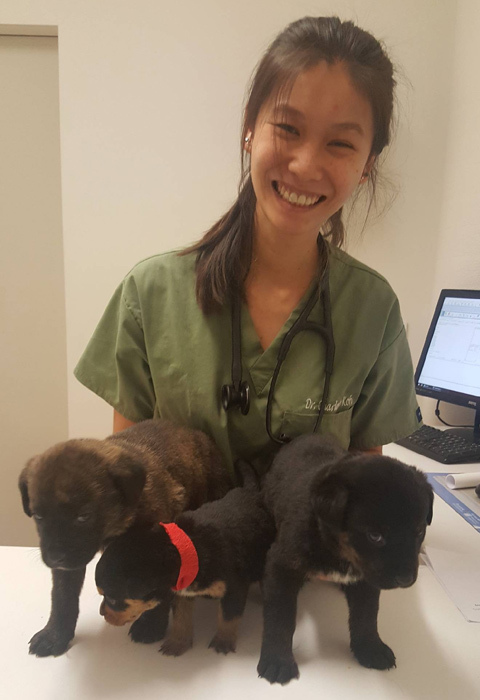 If your emergency occurs after hours, as they often do, please phone the surgery on (07) 5546 6205 where you will be directed to the vet on call. 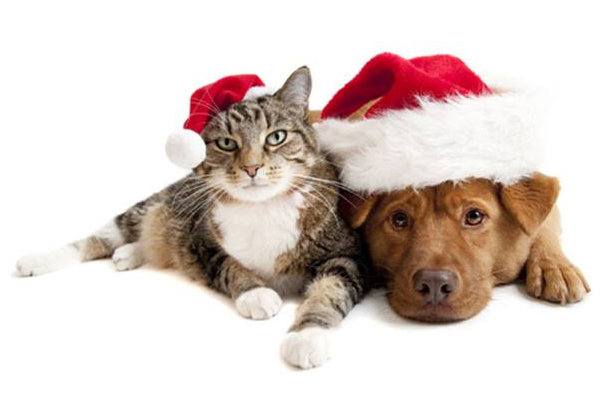 It’s that time of year again when you can get 20% off desexing of dogs and cat.s. Please keep your tick preventatives on board and search your pets for ticks on a daily basis. 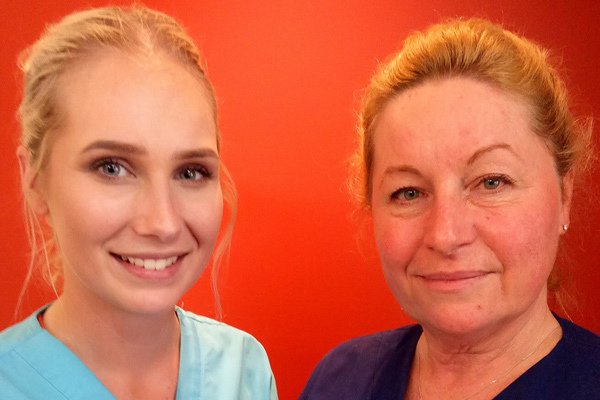 Jessica is our new junior nurse who has a passion for Puppies and also grooming! 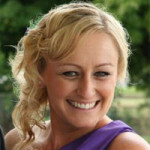 Julia will be doing some shifts with us in August to help out through dental month which is always a busy time of year. We are all exhausted after a big last week of NDN desexing month and now… ITS DENTAL MONTH! 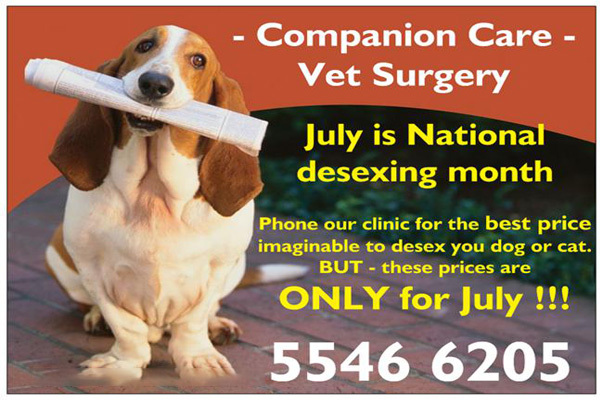 This is the last week of the NDN Desexing Campaign, so call our clinic this week to book a desexing. This is Milo, seen by Dr Charlene at Ormeau this morning for tick paralysis. 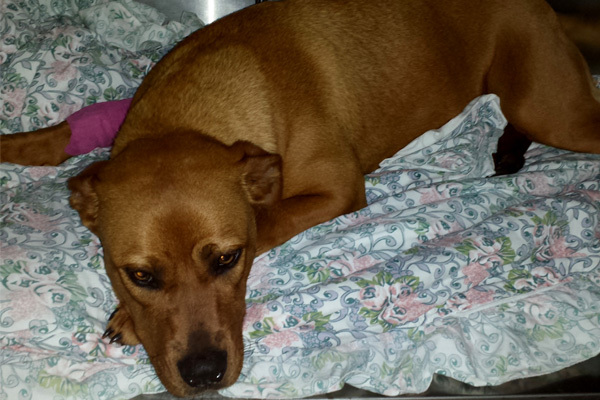 Milo was treated at Ormeau and then transferred to our emergency service at Arundel. I must admit to being extremely impressed by the level of equipment for a general veterinary practice (almost specialist level) and also the high level of practice performed. 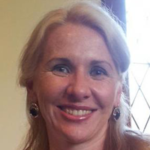 Dr. Robert has invested a great deal of time on further education(having achieved membership of the Australian College of Veterinary Surgery in Emergency Medicine) and also instructs other veterinarians on the usage of diagnostic ultrasound. 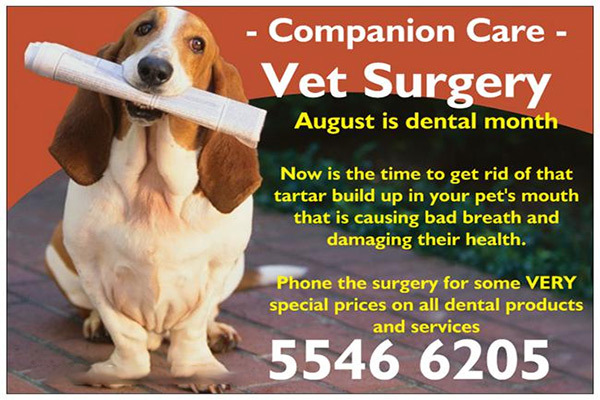 I would recommend his services to any pet owners that are looking for a high standard of practice on the Gold Coast. Bella had just finished her first round of laser therapy (5 sessions) and we have noticed a huge difference in her mobility and pain levels. She is moving a lot more freely and is able to run around a play more with her fur sister Shadow. I have even been able to cut back on her anti-inflammatory medications. To Dr Robert, Dr Jessica and all the wonderful nursing staff a big thank you for introducing this treatment option in your practice! I absolutely love the team at Companion Care Veterinary Surgery Ormeau, not only are the prices reasonable but the care for the animals and the owners is evident each time you walk in. Thank you team for saving my cat Iggy’s life and now for removing some of the worst tooth decay I’ve seen ever on our poor pup! You are all brilliant! Brilliant bunch of people and a great team. 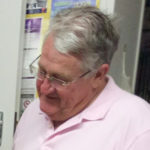 Robert is amazing, very thorough and has done wonders for our furbabies. I’d recommend the Ormeau veterinary surgery to anyone. Karen is awesome, so compassionate and an asset to the team, we’ve been going there for 14 years and counting. Thank you. Happy client for over 14 years! 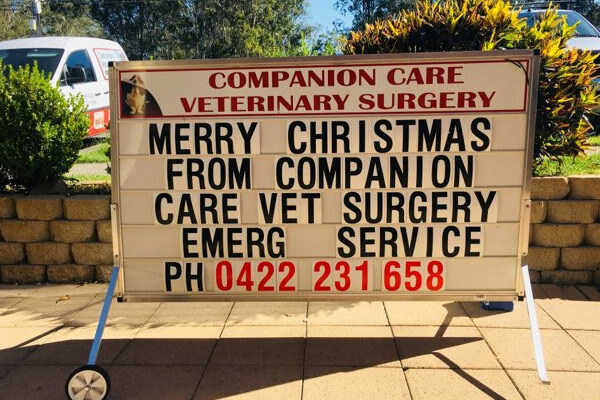 We have always received caring and professional treatment for our pets from Dr Robert Williams and staff at Companion Care Veterinary Surgery Ormeau and Arundel Veterinary Surgery and would recommend their services.